After my most recent purchases, the structural soundness of the books stacked in front of the bookshelves was in serious jeopardy. 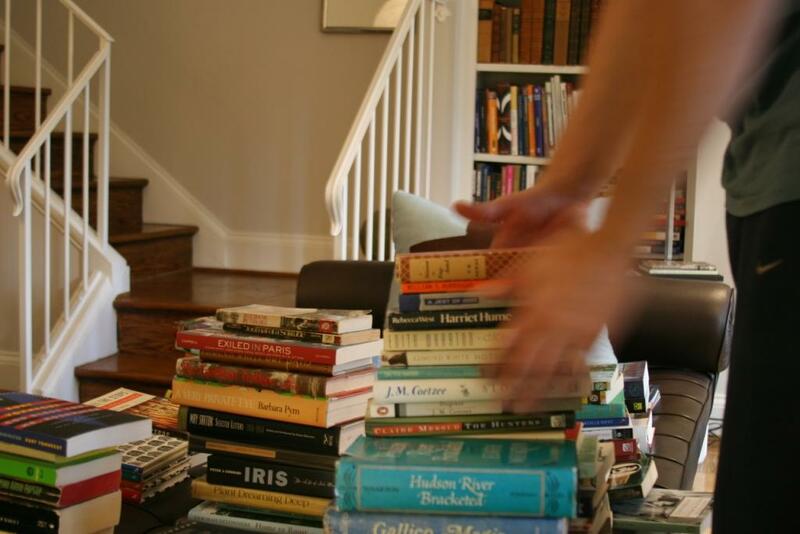 After much sorting I ended up getting rid of only about 12 books. So the end result wasn’t so much a reductionn in the stacks, but merely neater, sturdier stacks. I really can’t buy any more books until we find a house. We just don’t have the room anymore. Since we are off to Phoenix this weekend to visit my parents and my sister and her family I probably won’t have time to blog. So knowing that many of you share my interest in gazing at piles of books, I thought I would leave you with a whole gallery. Sorry you can’t see many of the titles. Maybe you could leave them out as decorative stacks. There's a very nice apartment (?) underneath all those books. You did get rid of 12, which is about the most I've ever done except on those now rare occasions when I've had to move. There's something about actually having to physically haul books to a new town that really helps you cull the collection. Hi Harriet Hume, I have you as well! Awesome book stacks. Your assortment looks pretty amazing. Did you ever count them…LOL? OK, I'm speechless. Hope you have a wonderful trip! I like your place! Is that John Travolta on telly? I have to copy Art and simply say jealous, jealous, jealous! I do like the way they are all laid out… couldnt you charge people to come in and look at them like modern art, it would also fund more book buying ha! Art: We do keep decorative stacks on the coffee table. Not as high as what you see here. Mainly art books and things a guest might be interested in paging trough. CB: I was surprised I was able to find 12. Even though they were all books I didn't like, and in some cases didn't even finish, it was still hard to cull them. Mel: Thanks, it certainly makes me happy. Sometimes I just stare at it thinking about past and future adventures. Amanda: Have you read your copy of Harriet Hume? Parts of it I loved and then other parts I thought were just so/so. Diane: I have not counted. One bored night I started to log them into one of those home library sights. I quickly realized it was one of those compulsive, time-waster tasks that I love. But also realized it was keeping me from other things. So I abandoned doing it. JoAnn: Well the cabin was about 90 degrees on the very crowded flight out here so the trip can only get better right? Overdue: LOL. Not Travolta. It was some cheesy acapella singing group on PBS during their pledge drive. The kind of acapella group that flourish at expensive northeastern colleges. And they don't do traditional acapella choral music they do stuff like reinterpreting U2 and stuff like that and the college-age (and older) girls (and probably a few boys) scream like it was the second coming of Elvis. 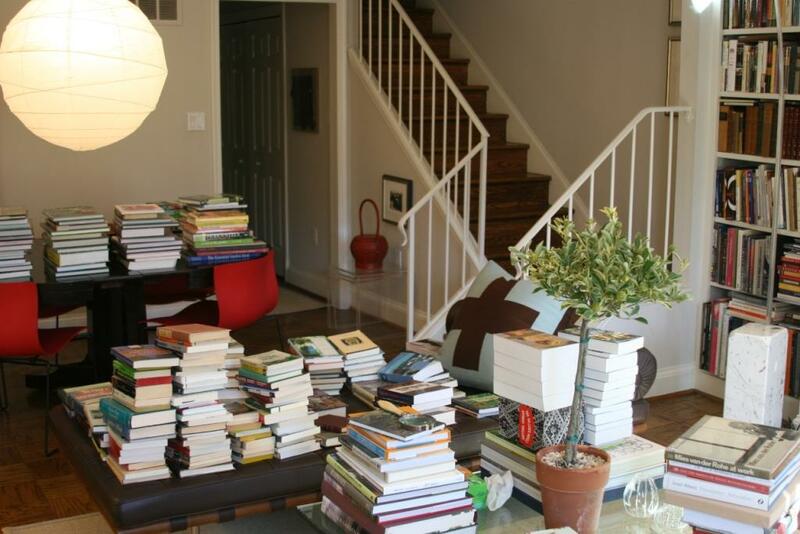 Simon S: When I first met my partner he never would have allowed all those books. He is allergic to dust and tried to convince me that having all those books would make conditions worse for him. Well, somehow I managed to change his mind on that and 7 years later he buys almost as many books as I do. Wow. Beautiful books. 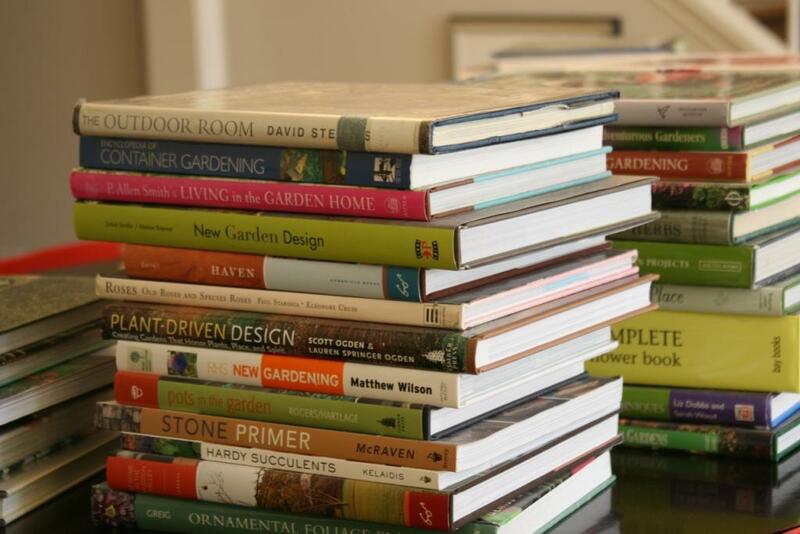 And I am drooling over the photo with all the garden books in it! 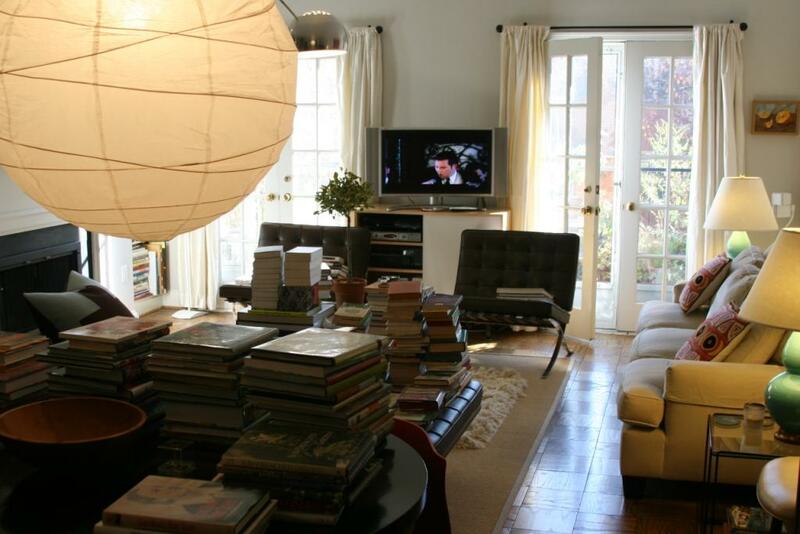 To me, books fit right in with the furniture and your pics support my theory. Wow! I love this room. And all the books. Love love love your place! 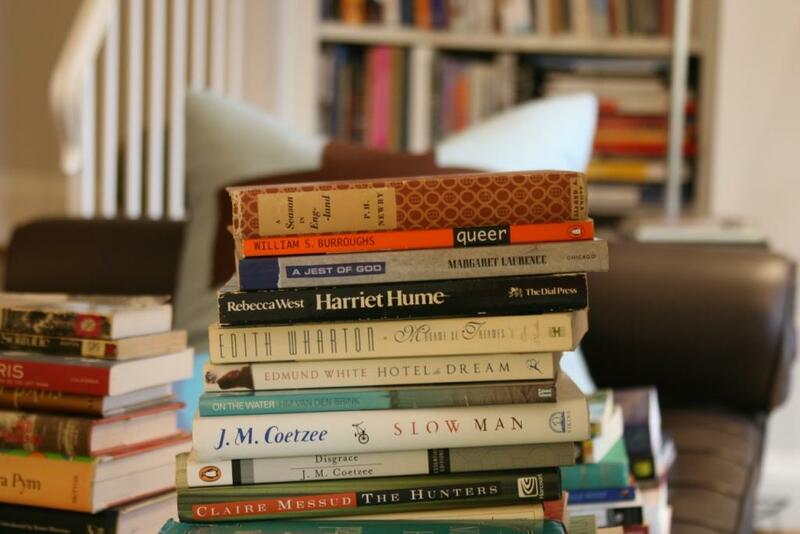 Having books stacked around the house like that is my idea of heaven. Thanks for sharing Thomas! 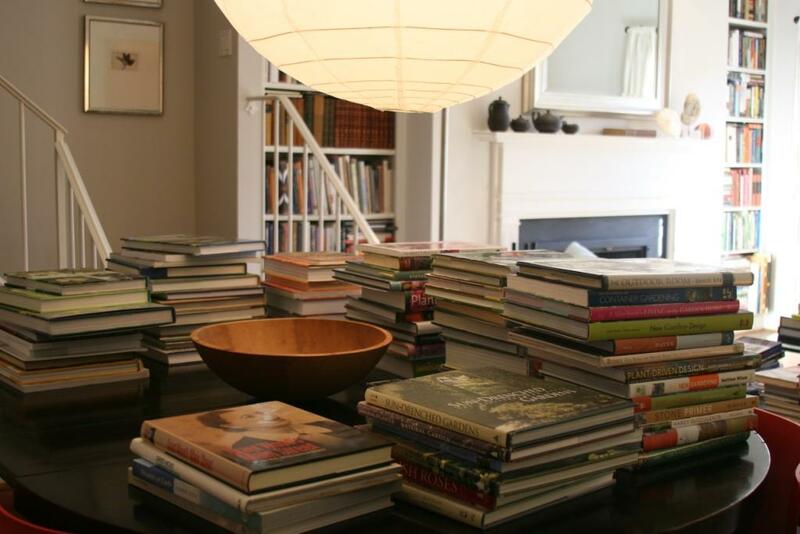 I am jealous of all the beautiful books. I have a lot myself, but they are not nearly as beautifully housed. What a beautiful home you have, Thomas; the books of course add to that beauty. I am so jealous of all your books, Thomas! Very nice! 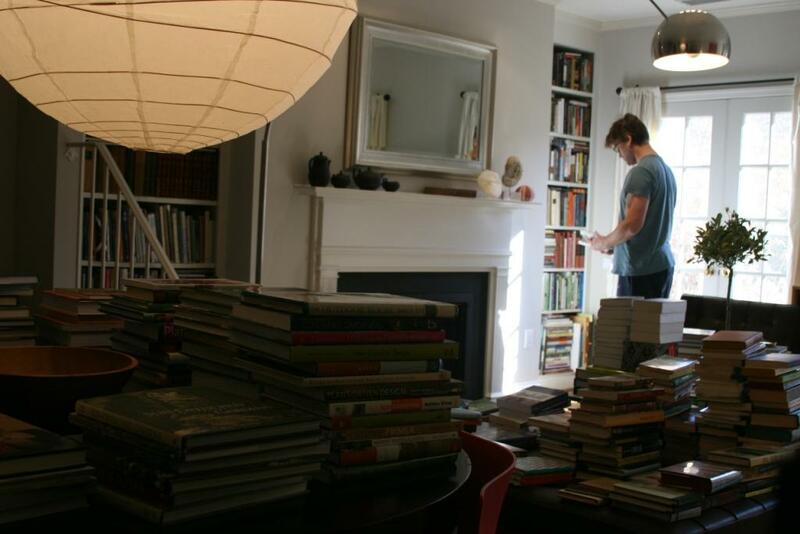 I am also jealous (and running out of bookshelf space myself). 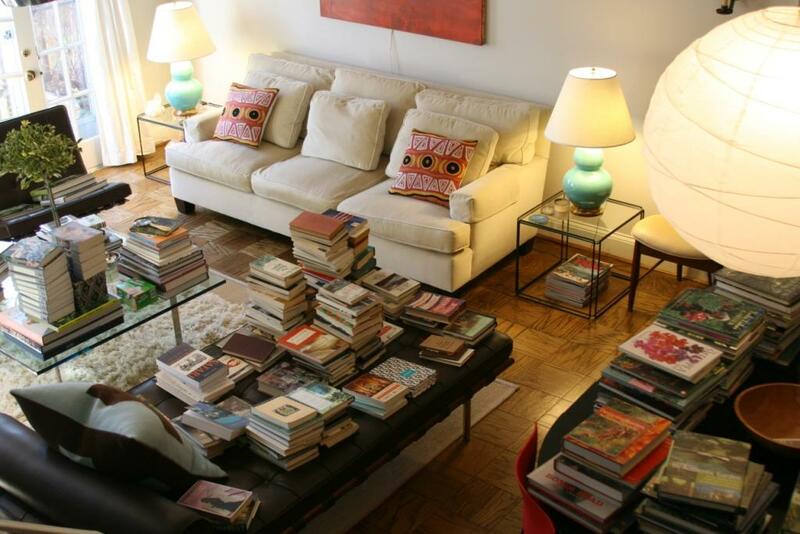 Loved the photos, the books make your place seem so homely, a place to relax and enjoy. Malnurtured snay: Thanks for stopping by. I think this might be what heaven looks like! Yay! Georgia is on My Porch. Its been too long since we chatted. And your apartment is gorgeous. Simon T: But once you find the place that can hold all of your books, you will be so happy to be reunited with your whole collection. Your living room is beautiful: cozy and elegant! 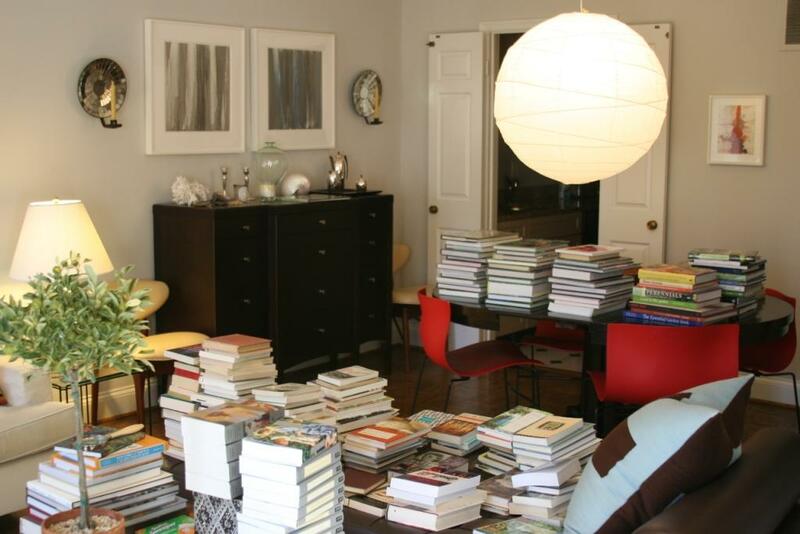 I have the same problem with PILES of books EVERYWHERE. They're like children -i'm slowly parting with them but I seriously just need a new (larger) apartment or different addiction! ArchitectDesign: Well we are hoping to buy in the spring so I am not giving up any until I know they won't fit in the new house. Wow! This is really what a house should look like. Madbiblio: I agree. A house without books is boring.